Simon & Schuster, 2007. Hardcover. Acceptable. Disclaimer:A readable copy. All pages are intact, and the cover is intact. Pages can include considerable notes-in pen or highlighter-but the notes cannot obscure the text. At ThriftBooks, our motto is: Read More, Spend Less.Dust jacket quality is not guaranteed. Simon & Schuster, 2007. Hardcover. Acceptable. Disclaimer:A readable copy. All pages are intact, and the cover is intact. Pages can include considerable notes-in pen or highlighter-but the notes cannot obscure the text. The dust jacket is missing. At ThriftBooks, our motto is: Read More, Spend Less. Simon & Schuster, 2007. Hardcover. Good. Disclaimer:A copy that has been read, but remains in clean condition. All pages are intact, and the cover is intact. The spine may show signs of wear. Pages can include limited notes and highlighting, and the copy can include previous owner inscriptions. The dust jacket is missing. At ThriftBooks, our motto is: Read More, Spend Less. Simon & Schuster, 2007. Hardcover. Good. Disclaimer:A copy that has been read, but remains in clean condition. All pages are intact, and the cover is intact. The spine may show signs of wear. Pages can include limited notes and highlighting, and the copy can include previous owner inscriptions. An ex-library book and may have standard library stamps and/or stickers. At ThriftBooks, our motto is: Read More, Spend Less.Dust jacket quality is not guaranteed. Simon & Schuster, 2007. Hardcover. Acceptable. Disclaimer:A readable copy. All pages are intact, and the cover is intact. Pages can include considerable notes-in pen or highlighter-but the notes cannot obscure the text. An ex-library book and may have standard library stamps and/or stickers. At ThriftBooks, our motto is: Read More, Spend Less.Dust jacket quality is not guaranteed. Simon & Schuster, 2007. Hardcover. Good. Disclaimer:A copy that has been read, but remains in clean condition. All pages are intact, and the cover is intact. The spine may show signs of wear. Pages can include limited notes and highlighting, and the copy can include previous owner inscriptions. At ThriftBooks, our motto is: Read More, Spend Less.Dust jacket quality is not guaranteed. Simon & Schuster, 2007-04-10. Hardcover. Good. Hard cover book with average shelf/handling/edge wear. Clean inside pages. Fast shipping! Simon & Schuster, 2007. Hardcover. Acceptable. Disclaimer:A readable copy. All pages are intact, and the cover is intact. Pages can include considerable notes-in pen or highlighter-but the notes cannot obscure the text. An ex-library book and may have standard library stamps and/or stickers. The dust jacket is missing. At ThriftBooks, our motto is: Read More, Spend Less. Simon & Schuster. Used - Good. Ships from Reno, NV. Former Library book. Shows some signs of wear, and may have some markings on the inside. 100% Money Back Guarantee. Shipped to over one million happy customers. Your purchase benefits world literacy! Simon & Schuster. Hardcover. 0743264738 Has some shelf wear, highlighting, underlining and/or writing. Great used condition. A portion of your purchase of this book will be donated to non-profit organizations. Over 1,000,000 satisfied customers since 1997! We ship daily M-F. Choose expedited shipping (if available) for much faster delivery. Delivery confirmation on all US orders. . Very Good. New York, ET AL: Simon & Schuster. Very Good in Very Good dust jacket. 2007. First Printing. Hardcover. 0743264738 . Simon & Schuster, 2007-04-10. Hardcover. Good. Simon & Schuster. Used; Good. Simon & Schuster 2007 Hardcover. This is a former library book, with library markings. Text itself is clean and unmarked. Jacket has light wear. Book Condition; Good Jacket Condition; Good . 2007. HARDCOVER. Simon & Schuster, 2007. Hard Cover. Very Good/Very Good. Almost new hardback and jacket. Only slight wear. Text is clean, unmarked. (Shelf location: V) All items carefully packed to avoid damage from moisture and rough handling. Tracking included. U.S.A.: Simon & Schuster. Hardcover. 0743264738 A very nice book from private collection. Clean, tight, square copy with only light used wear. A very nice copy over all. NOT Ex-Library. NOT Remainder. . VG+ , First Edition . Very Good. 2007. 1st Edition. Simon & Schuster. Hardcover. 0743264738 . Fair. 2007. Simon & Schuster. Hardcover. 0743264738 We carry new, used, and remaindered books - some books may have remainder mark and/or underlining. We often have multiple copies per title - and have over 20,000 discounted titles available. Symposium Books is an Independent Bookstore with locations in Providence, RI near Brown University and RISD and in East Greenwich, RI. We are dedicated to providing our customers with the widest selection of scholarly, literary and quality art books. Expedited shipping is available. We pride ourselves on offering prompt, reliable customer service and a no hassle return policy. . Fair. New York: Simon & Schuster, 2007. (2007), 675pp, illus., 1st ed., 1st printing, light shelfwear to cover, light rubbing & edgewear to dj, contents clean.. First Edition. Hard Cover. Very Good/Very Good -. Simon & Schuster. Hardcover. 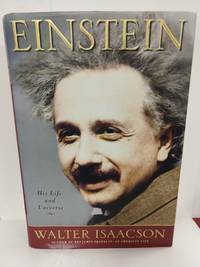 0743264738 Isaacson, Walter. 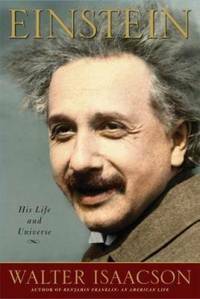 Einstein: His Life and Universe. New York City: Simon & Schuster, 2007. 675pp. Indexed. Illustrated. 8vo. Hardcover. Book condition: Very good with a bumped spine and rubbed edges . Dust Jacket Condition: Very good with bumped edges. . Very Good. 2007.